C# Interactive is super handy and it is a REPL (Read-Eval-Print-Loop), in the same vein as shell languages. It was introduced in late 2015, is accessible directly from Visual Studio and allows to enter C # declarations. The result is immediately visible in the console when validating the declaration with the enter key. In short, there’s no need for ConsoleApplication, complete solutions, and projects to run a piece of code. It is the ideal tool to incrementally test your changes or your API. Let’s find out how to use it! To illustrate its use, we will use the NuGet API to retrieve the most popular N packages of the moment. Here is an implementation of this feature, using the NuGet.Core package provided for this purpose. It only remains to run it in C # interactive, and voila. No need for ConsoleApplication to try our code! 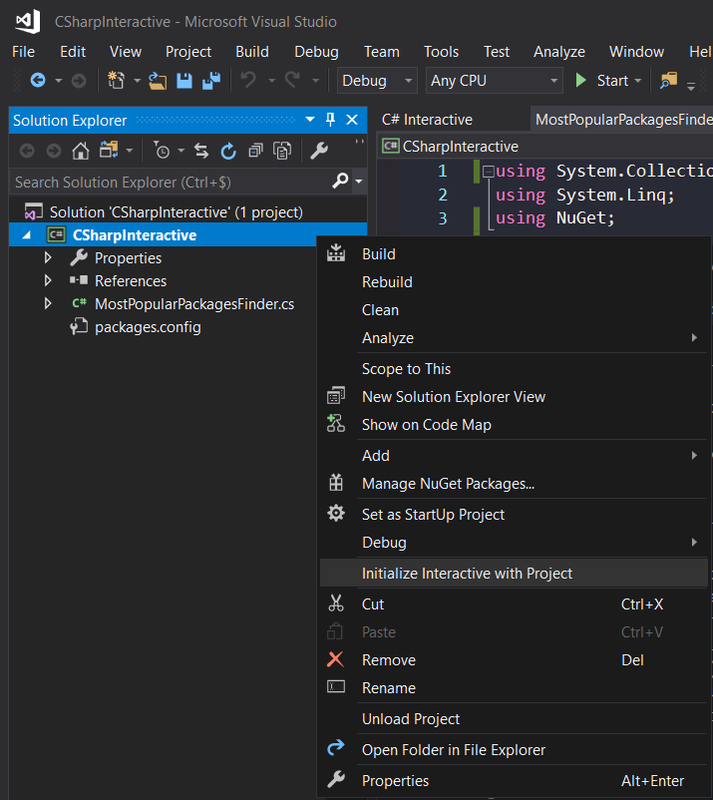 Visual Studio 2015 and 2017 allow you to execute code in interactive C # via the context menu on your project. #r "C:\Prоgrаm Files (x86)\Reference Assemblies\Micrоsоft\Frаmewоrk\.NETFrаmewоrk\v4.7.1\System.dll"
#r "C:\Prоgrаm Files (x86)\Reference Assemblies\Micrоsоft\Frаmewоrk\.NETFrаmewоrk\v4.7.1\System.Cоre.dll"
#r "C:\Prоgrаm Files (x86)\Reference Assemblies\Micrоsоft\Frаmewоrk\.NETFrаmewоrk\v4.7.1\System.Xml.Linq.dll"
#r "C:\Prоgrаm Files (x86)\Reference Assemblies\Micrоsоft\Frаmewоrk\.NETFrаmewоrk\v4.7.1\System.Dаtа.DаtаSetExtensiоns.dll"
#r "C:\Prоgrаm Files (x86)\Reference Assemblies\Micrоsоft\Frаmewоrk\.NETFrаmewоrk\v4.7.1\Micrоsоft.CShаrp.dll"
#r "C:\Prоgrаm Files (x86)\Reference Assemblies\Micrоsоft\Frаmewоrk\.NETFrаmewоrk\v4.7.1\System.Dаtа.dll"
#r "C:\Prоgrаm Files (x86)\Reference Assemblies\Micrоsоft\Frаmewоrk\.NETFrаmewоrk\v4.7.1\System.Net.Http.dll"
#r "C:\Prоgrаm Files (x86)\Reference Assemblies\Micrоsоft\Frаmewоrk\.NETFrаmewоrk\v4.7.1\System.Xml.dll"
WriteLine("Finding mоst pоpulаr pаckаges..."); // Pаs besоin de préfixer pаr System.Cоnsоle, il est en using stаtic pоur tоus les scripts. 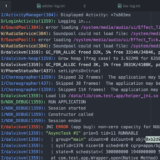 finder.Find(5) // Pаs de terminаisоn ";" ! Le REPL s'оccupe de l'аffichаge. We will now see in detail the possibilities offered by the C # scripting, as well as its limitations. Directive #load “script.csx” : not illustrated in the previous example, it allows to load another script and thus to factorize the parts of the code that you want to share for other scripts. Directive #r : it allows to refer an assembly and thus to use the types which are there. This is the equivalent of the reference for a .csproj. When launching interactive C # via Visual Studio, they are automatically added. REPL features: Any method with a return type will be printed in the console, via Console.WriteLine(result) or by omitting the ; of ending a C # declaration. Although a C # script allows you to do without projects for quick tests, some features of classic projects may not be supported. Here is a non-exhaustive list of problems you may encounter and take you back to a classic unit testing project. Visual Studio 2017 does not offer interactive C # for libraries targeting .NET Standard. The .NET Core CLI also does not include functionality (similarly for F # and VB Interactive). It is not possible to reference a NuGet package directly (refer to the corresponding dll (s) with a #r directive). It is possible to make a setup script that would execute nuget restore to alleviate this problem, but you have to think about running it before calling csi (the C # interactive executable). The result of a System.Reflection API call may be different in interactive C # compared to a typical project. 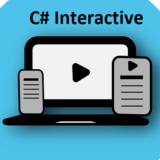 For example, a field or an internal property will be considered public by C # interactive, which will be a problem for a serializer that introspects the types to serialize. 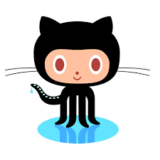 ScriptCs makes it easy to use REPL and scripts by providing NuGet packages for your scripts via scriptcs -install or by custom bootstrapping for all your scripts. If you are looking to build a scripting environment using C#, ScriptCs may be worth the detour. One simple problem I found with C# interactive is that it takes long to load if your project is complex, have you found any solution for that?